This week in movies you missed: In our world of omnipresent cameras, it's hard to believe that a regime could starve and slaughter millions of people and leave little direct evidence of its atrocities on film. But that's what the Khmer Rouge did in Cambodia from 1975 to 1979. Among its victims were the family of Rithy Panh, this film's director, who was then 11 years old. Panh made this documentary to fill in history's "missing pictures" with those he carries in his memory. 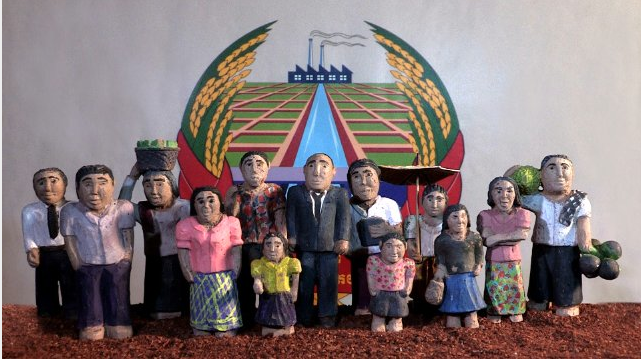 He uses clay figures and dioramas to illustrate deportation, forced labor, "re-education" and genocide, supplementing these images with existing documentary footage (much of it from Khmer Rouge propaganda films). 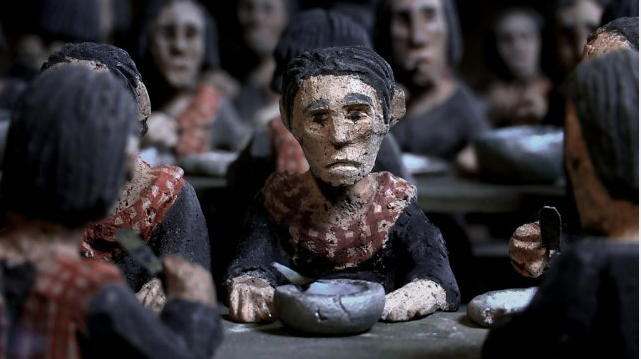 The Missing Picture earned an Oscar nomination last year for Best Foreign Film and was honored in the Un Certain Regard section at Cannes 2013. Voice-over narration by Jean-Baptiste Phou (in the English-language version) tells Panh's story. It starts with tableaux of Phnom Penh in the early '70s — a lively city where young Panh, whose father teaches school, visits film studios and marvels at the beautiful actresses. On April 17, 1975, the communist revolutionaries take the city. They herd the urban dwellers onto transports and bring them to the countryside, leaving the city a wasteland. They take their possessions and dye their clothes black. They force them to abandon modernity and work the land on starvation rations. They take away pens and eyeglasses. They control every aspect of their lives. Some members of Panh's family disappear. Others sicken and starve before his eyes. He watches as children are goaded to inform on their parents, as people are killed for infractions against revolutionary protocol as small as eating fish or berries, as mass graves fill with corpses. And he survives — but this isn't really his story. It's a sustained effort to remember and visualize those who did not. Widest U.S. release: nine theaters. Raise your hand if you've ever postponed watching a film about genocide or other historical atrocities. I sure have. You already know about it, the logic goes, and it's not like you're going to enjoy seeing it. If you do enjoy it, there's something wrong with you. So why subject yourself to a film like this unless you're watching it in a class or at a solemn film festival where everyone can achieve catharsis in a post-film discussion? Why? Well, Rithy Panh gets that. He gets that we don't go to the movies for a grim recital of horrors (which we could just as easily read in a history book), but to satisfy our imaginations, to be transported by all the resources of art. And he gives us that transportation in ways that are both horrifying and (occasionally) beautiful. This isn't a prosaic documentary, but an elegy that cuts abruptly, without explanation, to shots of ferocious ocean waves battering the camera. It offers the facts, but also, and more centrally, the feelings. 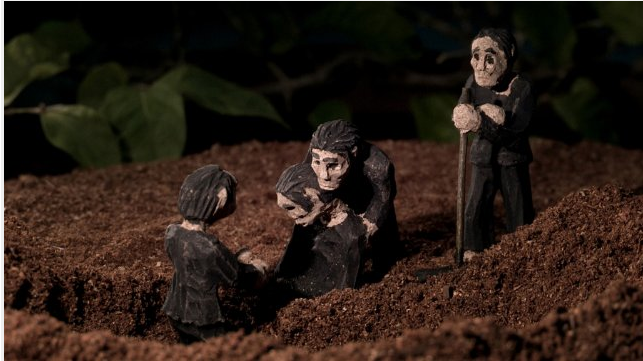 We watch the clay figures "die"; then we see them "reborn," free, dressed again in their colorful pre-revolutionary attire and soaring across a painted sky. Those toys begin to seem more human than the laughing children of the propaganda footage, who represent an image far from Panh's remembered reality. Cinema, he notes, was a victim of the Khmer Rouge, which closed theaters and killed off the leading lights of Cambodia's film industry. One party-assigned director died for capturing images that didn't reflect the ideologically approved version of reality. What would it be like to lose your entire life so you could enter someone else's heaven — to be forced, in essence, into a nationwide cult? When we contemplate such things, our minds shut off. Using his increasingly battered clay figures, posing them in ways that mimic children's play, Panh finds a way back into our imaginations. He forces us to put ourselves in the scenario, then gives us small instances of defiance and resilience to keep us sane. Verdict: A film to place beside The Act of Killing. One is a character study in evil and the other an act of artistic witnessing and mourning. But both offer reasons to dwell on the unthinkable, suggesting that these are horrors humanity is better off not forgetting, lest they repeat themselves. At the Savoy: Snowpiercer, Gore Vidal: The United States of Amnesia and the reissue of A Hard Day's Night. At the Roxy: Walking the Camino, Walking With the Enemy. At the Palace: Paul Haggis returns with Third Person. Most everywhere: Dawn of the Planet of the Apes. Bad Words, Jodorowsky's Dune, Nymphomaniac, Vols. 1 & 2, The Raid 2, Le Week-End. The Missing Picture (L'image manquante) is not showing in any theaters in the area.